I made this display this morning. The numbers can be printed in A4 or A5 from twinkl. I printed them on coloured paper and then laminated them. I then typed out a list of activities/questions – stuck them on card and laminated these too! You can make it as easy or as difficult as you like! 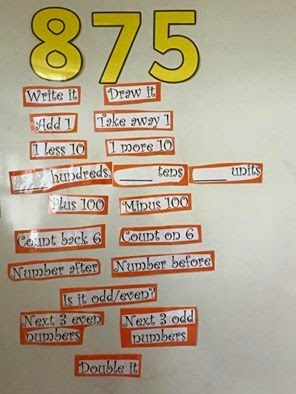 It can be used throughout the day – as a starter activity for maths, a morning work activity or something for early finishers.